pretty obvious way for Congress and the president to get back on the public’s good side, no? So that’s the poll. And now to random kvetching. I went ahead and took their “How satisfied are you with government?” quiz, and it turned out that I was surprisingly satisfied. More on that later. For now, though, I just want to highlight question #6 as a sign of how impoverished our discourse has become. 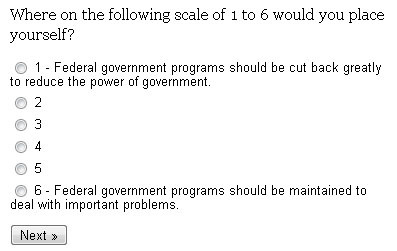 When Pew asked about your preferred size of government, the answers ranged from “way smaller” to “the same as now.” Apparently the folks who designed the poll were literally unable to believe that any significant number of people might want government services expanded. This is despite the fact that their own surveys have shown that about 40% of Americans would prefer a bigger government that offered more services. We liberals still have some work to do.